Can you believe that Christmas is next week? I'm having a hard time with this. I live in Ohio, so we've usually had several rounds of snow by now. It was in the 60s yesterday! I am definitely not complaining about the weather, but it's making it a little hard to get in the Christmas spirit. My tree is up, the house is decorated, and I'm working on my shopping list. I'm not as far as I would like on my list, but it will get done eventually. I like to make something for my friends as a little something to make them smile. 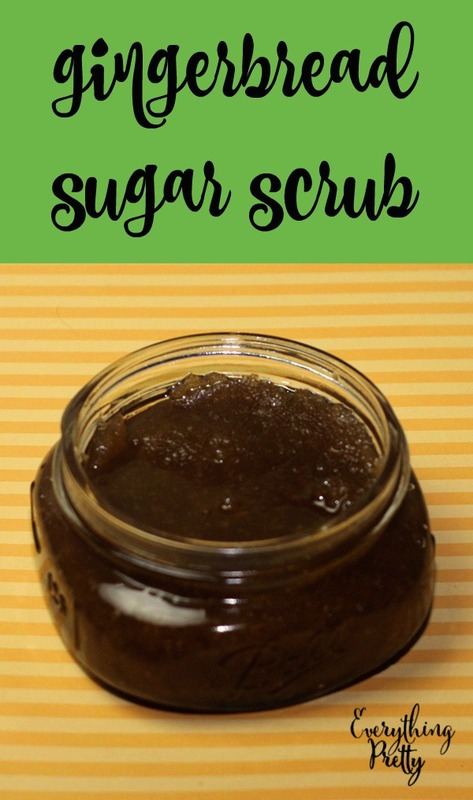 This year, I decided to make this DIY gingerbread sugar scrub recipe. I would give this to teachers, but my kids are homeschooled this year. If your kids have teachers, this is a great gift for them too. Last year, I had two kids in public school, and they had over 10 teachers between them, not including specials! I definitely understand the need for inexpensive yet awesome gifts. Just mix all of the ingredients in a medium bowl and stir well. You can double the recipe to make several of these at once. I used fractionated coconut oil because it's a dry oil and not as oily as olive oil or almond oil. Grapeseed oil is also not as oily, and you can find it is most supermarkets. If you want to get fancy, tie a ribbon around the neck of the jar and add a sticker to the top of the jar. I hope you enjoy this easy DIY gingerbread sugar scrub recipe! Let me know if you try it.